Tips to Happiness and Bliss! An entertaining and thought-provoking look through the eyes of a woman inspired by her own spiritual inner journey. Her creative inspirations reflect a perspective gently tempered by her experiences with Eastern culture and memories of her homeland. Each page has been crafted to reveal what may be a hidden facet of our own true nature. Ironically, and more synchronicity than planned, it was released on the blue moon so it deserves it’s big send-off to my followers on MoonLightened Way! Whispers to the Sky is currently available in paperback through Amazon.com here. If Amazon isn’t available to you or you prefer, you can also purchase it through CreateSpace.com here. Kindle version will be available in about 14 days. I’ll be posting that link as soon as it’s available. I hope you like it! 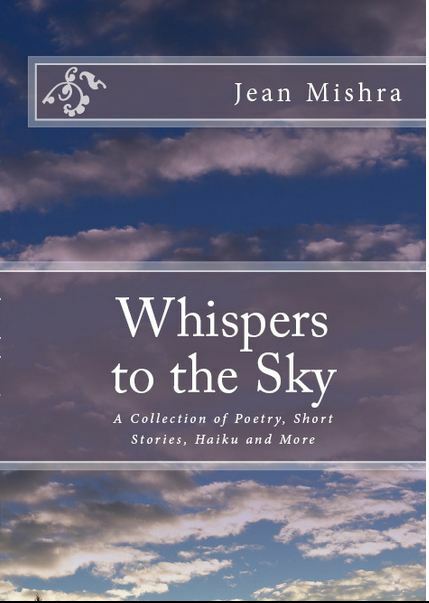 This entry was posted in Poetry, Prose and Short Stories and tagged Books, poetry, Religion, short stories, spirituality, writing by Jean Mishra. Bookmark the permalink. Thank you, R. G. I appreciate you reading! WOW!! What an accomplishment. I will enjoy the read. Thank you! I hope you like it. Thank you, auroras. Very much appreciated. Congrats to you. I am waiting for the kindle version; so that I can read it. 🙂 I am sure it will do good. Thank you, Arindam. I’m still working with Kindle to get it up and going as well as Smashwords so the digital version is available through other vendors. I’ll let you know. Jean–Congratulations!-I am looking forward to your book! Will get it on my Kindle! How was it working with Create Space, Kindle, and Smashwords? Any words of advice? I am working on two projects but am clueless as to formatting etc….any advice? Hi, Kate. It’s great to see you back! I would recommend all 3 if you’re going to self publish: Create Space for a physical book, Kindle and Smashwords. Smashwords also submits to Kindle but it’s a slow process and they recommend folks to go ahead and submit to Kindle on their own. It’s your preference. I found all 3 were great to work with. The formatting takes some patience, but if I can do it anyone can. All 3 provide you with clear step-by-step guides as well as support. I would also be willing to help. I’m no expert by any means, but I did get it figured out. The hardest part is publicizing and I’m still wading through that. The best advice I can offer is to check the guides ahead of time. I wish I had before I even began compiling the document because I ended up having to reformat everything. Again, it wasn’t particularly a problem but I could have saved myself some work. Let me know when you decide to take the plunge! © Copyrights Reserved @moonlightenedshelves.wordpress.com and Jean Mishra. Unauthorized use and/or duplication of this material without written permission from the author of this blog is strictly prohibited. Excerpts and links may be used, provided that complete and distinct credit is given to moonlightenedshelves.wordpress.com and Jean Mishra with specific link to the original content.